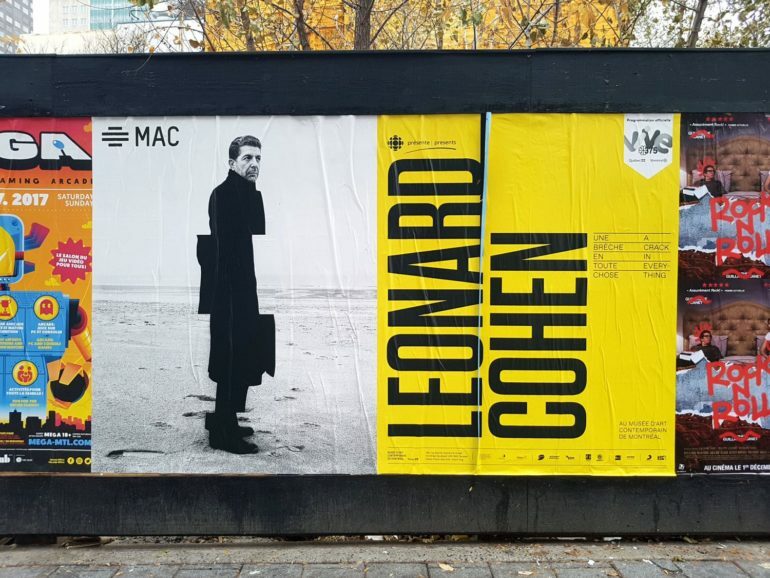 “Leonard Cohen: A Crack in Everything,” the exhibition approved by Cohen himself that debuted in Montreal in 2017, is, as Pitchfork reports, beginning its international tour from The Jewish Museum in New York before departing for Europe and elsewhere. The exhibition will remain in New York from April 12 until September 8, 2019. The Museum program announces that the exhibition will feature 12 artists and 18 musicians from 10 countries, including Kara Blake, Candice Breitz, and Christophe Chassol, among the artists, and Julia Holter, Jarvis Cocker, and Sufjan Stevens, among the musicians. In its preview of the exhibition that is spread over three floors, Pitchfork points out the multimedia character of the exhibits. These include IMAX video showings of biographical clips, live music and poetry performances, art installations, and a special listening room that plays Cohen’s compositions as performed by contributing musicians.